If you have an aging furnace in your house and you're considering replacing it, you're probably wondering how much does a new furnace cost. While it may be tempting to just call up a local contractor and replace your existing furnace with a new one that is nearly identical, if you do your homework you could end up saving a fortune in the long run. If you went online and reviewed the prices for furnaces, you may be tempted to go with the cheapest furnace you can find. The problem is that there are many types of furnace systems, and the retail price of the furnace doesn't always tell you the whole picture. There are many different methods that you can use to heat your home and the water you use every day. Natural Gas - Natural gas heat sources, such as propane heaters, use natural gas as a fuel to heat the water or air that is used to heat your home. While the price of natural gas isn't always the lowest of all fuels, it is the most efficient. Since you can obtain more BTU (heat energy) from less fuel, the higher price is offset by the amount of heat you can obtain per volume of natural gas. Oil - Oil furnaces are the most common in the Northeastern U.S. because of the lack of easy access to natural gas. An oil heating system includes a large oil tank (usually in the basement or just outside the house) connected to the oil burner, which uses the oil as a fuel to heat water or air. Oil is still the most common home heating fuel in the coldest parts of the country. Alternative - As fossil fuel supplies become hampered by either political or natural pressures, more homeowners are turning to furnaces that can utilize natural supplies of fuel found in the local area such as corn, sustainable wood products or heat pump systems. Regardless of the heating system you choose, you'll need to consider several factors when you want to determine how much does a new furnace cost. Those factors include efficiency, installation, maintenance and other variable factors. If you purchased a home that has the original furnace, the odds are good that the furnace is approximately 15 to 20 percent less efficient than modern furnaces. This is because the technology constantly improves, so if you buy a new furnace today you will be saving a great deal on your heating fuel costs simply because your new furnace will consume much less. Furnace efficiency is the rate at which the furnace can convert your fuel into heat. Regardless of the fuel, whether it's wood, oil, or natural gas, the rated efficiency tells you how much fuel is converted to heat, and how much is "energy loss" as part of the combustion process. In the 1980s and 1990s, furnaces had efficiencies averaging about 80 percent. By 2009 or 2010, furnace models had efficiencies ranging from 90 percent to as high as 97 percent. While higher efficiency will lead to fuel savings over the long-term, you will have to pay more for the furnace when you purchase it. Sometimes the payoff for that higher investment is as far out as five years or longer. If you're thinking how much does a new furnace cost, a simple answer is that the more efficient it is, the more expensive it will be. Additionally, the larger the furnace, the more more expensive it will be. Furnaces are usually rated in the BTU (energy) output and fuel efficiency; many people believe that the largest furnace you can afford is best, but this isn't always the case. Size the furnace correctly for the home, or it will heat the home too quickly and could end up cycling on and off too frequently. Because a furnace pump is usually powered by electricity, you could see electric costs and furnace maintenance costs rise with frequent furnace cycles. Always ask your installer to size the furnace appropriately for your home. In addition to size and efficiency, there are other factors to consider when you are calculating the "true cost" of a new furnace. Tax Breaks - Does your local municipality offer either one-time or annual tax credits if you install a more efficient or alternative home heating system like a heat pump? Installation - Different furnace types require different levels of installation. Will you be running new piping or air ducts through the home? Will you need to install a new oil or propane tank? These are also important cost considerations. 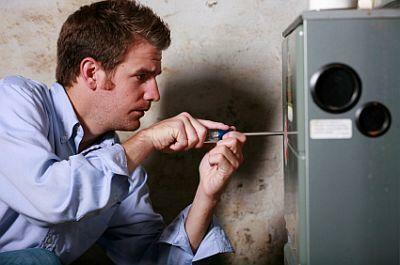 Maintenance - A heating system with fewer moving parts, like an electric heater, requires very little maintenance. However, if you have a furnace that has to constantly circulate water or air through the home, the pumps and valves will need regular monitoring and maintenance to prevent a breakdown. Check with furnace retailers to determine the recommended maintenance schedules for the various types of furnaces and include that in your cost calculations. Environmental - For some people, cost involves more than just money. What impact will a less efficient furnace have on the environment and is that a cost that you're willing to accept. Some people opt for more expensive, higher-efficiency furnaces simply to reduce the environmental cost, and not necessarily just the financial one. As you can see, the cost of a new furnace has a less to do with the price tag and more to do with efficiency, maintenance, installation and many other long-term factors. Try to take much of that into account when you choose your new furnace.